If you’re a first time cruiser, you may be unfamiliar with the term “tendering.” Essentially, tendering is another way of disembarkation at port. The method involves anchoring somewhere close to shore (but not adjacent to the dock) and then taking a smaller boat to shore. 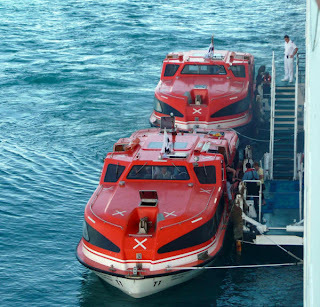 These boats run back and forth, on a schedule, so that passengers may come and go throughout the day. Most of the time, it is likely that your ship will simply dock. This means that the ship will pull up right next to the dock at the port, and passengers may exit via ramp (called the gangway). The crew will typically provide assistance to passengers in wheelchairs/passengers with limited mobility. However, keep in mind that there may be times when crew members are not able to provide assistance due to safety related reasons, specifically during changing tides when the gangway may be too steep. Passengers can typically check with the Front Office staff on the ship to find out if wide tidal ranges are expected in the port of call. For special needs travelers, docking is probably the more convenient form of disembarkation. This doesn’t mean that you cannot go ashore if you are tendering, however! Be sure to contact your cruise line before your trip to find out if you will be tendering at any port. Inquire about accommodations for special needs passengers, and if you will need to make arrangements for tendering in advance. For travelers with special needs, tendering may require some planning ahead. If you are planning on traveling with an electric scooter or powerchair, ask your cruise line if you will be able to tender in your chair. It is likely that the ship will ask that you transfer to a manual wheelchair for the tendering process, and they will transfer your powerchair or scooter to shore separately. Depending on the weight of your scooter or powerchair, as well as other factors such as weather and sea conditions, it may not be possible to transfer your equipment to a tender. Keep in mind that there may be times when it is not safe to provide assistance to guests with limited mobility onto a tender. Factors like the configuration of the dock may also present challenges for providing assistance to passengers, even when transferring from the ship to the tender is not of concern. Remember that the decisions to provide assistance are made based solely on the safety of the passenger. Be advised ahead of time that special needs travelers may want to choose itineraries that do not require tendering. Some destinations (such as Grand Cayman) require that ships always tender, and rough seas/other conditions may make tendering difficult for passengers who require special assistance. Remember that if you’re interested in renting a wheelchair, powerchair, scooter, or other special needs equipment, we’ve got you covered! Visit us at www.specialneedsatsea.com today to rent your equipment in advance. Special Needs Group/Special Needs at Sea is the leading global provider of wheelchair rentals, scooter rentals, oxygen rentals and other special needs equipment rentals. Recommended by the world's major cruise lines for superior service and value, Special Needs Group also services guests visiting hotels, resorts, theme parks and convention centers. For additional information, visit www.specialneedsatsea.com.